The race begins at 9 a.m. and will race start and finish will on Arlington Street extension, near the Chelsea Station Restaurant (located at 105 Everett Avenue). PLEASE NOTE 9:00 a.m. start! A post-event celebration sponsored by the Chelsea Station includes lunch and two drink tickets for all registered runners/walkers and registered volunteers. All are welcome to join us as a runner, walker, volunteer, sponsor, or just come on out to cheer on the race and enjoy a fantastic day in Chelsea. 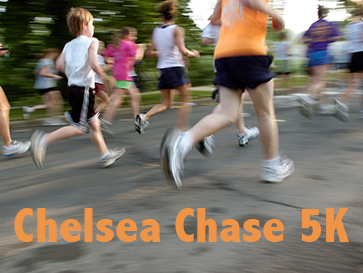 The Chelsea Chase 5K supports two great causes: The Jordan Boys & Girls Club in Chelsea AND the Chelsea Police Relief Association. This event supports programs for the 250 Club members who attend every day, participating in activities that help build values, skills, knowledge, and community. This event not only focuses on the overall health of our Club members but also giving back to the community through our strong relationship with the Chelsea Police Department.